Rainbow Animal Duo Figurines from Bayala series. 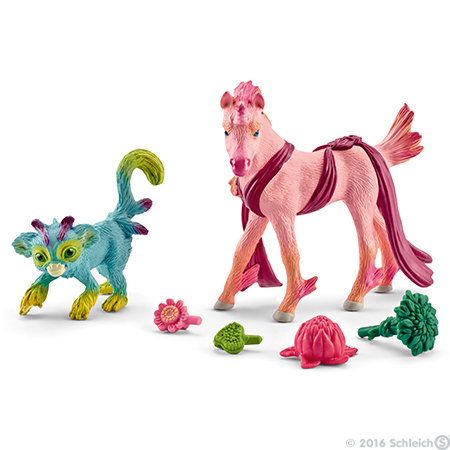 Apalu Kolala and Miriel Unicorn are made by Schleich in 2016. The figures comes with small accessories. Apalu, the little rainbow koala, and Miriel, the unicorn foal, have been best friends for a long time. While Apalu loves to sit in the tallest trees and eat sweet fruits, Miriel likes to play with the elf children and is much less shy than most unicorns. When Apalu appears on the edge of the forest, Miriel immediately gallops over to him and rubs her warm snout against him. Sometimes, Apalu brings sweet forest fruits for his friend, but usually the rainbow koala jumps up onto the unicorn?s back and rides through the horde of excited elf children. In the evening, Miriel then brings her rider back to the forest, where he quickly vanishes into the trees ? until their next meeting.